Referred to alternatively as the Battle of Gorizia, the Sixth Battle of the Isonzo, launched on 6 August 1916, proved easily the most successful of the eleven Isonzo attacks initiated by the Italians (with the twelfth - and most successful of all - launched by a combined German-Austro-Hungarian force). For a single-article background to the Isonzo battles click here. With popular clamour at home for Italian success on the battlefield in the wake of the near-disaster at Trentino, Chief of Staff Luigi Cadorna resolved once again to direct the force of his attack towards the capture of Gorizia. Unlike earlier attempts however the Italians finally met with success on the battlefield. With the Austro-Hungarian lines depleted following their concerted attack at Trentino (whereas Cadorna had made efficient use of railways to quickly ferry his own troops back to the Isonzo) and with the additional need to defend against the Russian Brusilov Offensive in the east, Gorizia fell and the Italians succeeded in establishing a bridgehead at last across the Isonzo. A separate diversionary attack at Monfalcone developed into a fierce confrontation on its own account and five days of close fighting followed. Cadorna gathered together 22 divisions along the Isonzo, against which were ranged some nine Austro-Hungarian divisions. Three days after hostilities renewed on 6 August Gorizia was in Italian hands and a bridgehead finally established across the river. With a hasty despatch of Austro-Hungarian troops to plug the hole the Italian advance was stemmed on 12 August. Nevertheless Cadorna had succeeded in moving forward 5km along a 20km front by the time he called off the offensive in satisfaction on 17 August. Casualties remained high as at earlier Isonzo battles: Italian losses ran at 51,000 and Austro-Hungarian casualties totalled 40,000 killed, wounded or taken prisoner. Despite this Italian morale experienced a marked boost. In the wake of this success the Italian government finally declared war on Austria-Hungary's ally, Germany, on 28 August 1916. This latest Isonzo battle marked a sea-change in Cadorna's approach to renewed offensives along the Isonzo. Henceforth the Italians switched tactics from broadly based diversionary attacks spread along the river to short, sharp initiatives tightly focussed upon a single objective. As it turned out these proved no more decisive than Cadorna's earlier strategy and the sixth battle proved the single noteworthy success of the Isonzo campaign. The offensive subsequently continued with the Seventh Battle of the Isonzo launched on 14 September 1916. 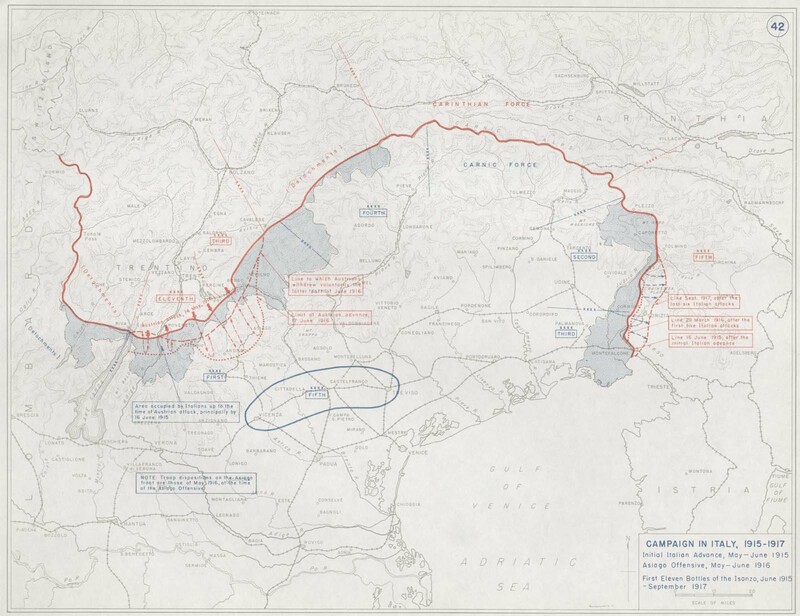 Click here to view a map charting the progress of the first eleven battles of the Isonzo.